If any Great Lakes troller who fishes trout and salmon in any of the Great Lakes is not fishing Jitterflies behind ruddered, rotating flashers like ProChip8s and 11s or the larger 13” Kingston Tackle Slashersor Okis, , find some, buy some or steal some from your best buds in the dark of night! If you have some that you’re willing to part with, call me! Why? Because Jitterflies are absolutely, definitely, without question one of the deadliest items onboard the Fish Doctor, for every species of trout and salmon in the Great Lakes…,PERIOD! …and they should be OUTLAWED FOR COHOS! My thoughts about Jitterflies are based on 17 years(since 2001) trolling flies in Lake Ontario and 11 years fishing Jitterflies since I first got them wet in 2007. JItterflies catch fish all season long, but become increasing deadly late in the season. Stepping back a bit, Jitterflies first produced in 2007 and after some fine tuning were available to anglers in 2008. Long story short without going into the gory details, production was eventually discontinued after a few years. Having done the original field testing with Jitterflies and being involved with their design and development, I knew the unbelievable potential of this unique, actionized fly, and took it from there, improving the original. What’s different about them? ACTION and NOISE! Watch them in the water boatside and you’ll see. 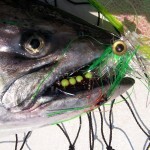 Sparsely dressed, they vibrate in the water and the turbulence of the water as it passes around the plastic disc at the head of the fly actionizes the mylar skirt. This vibration and turbulence produces a “hperaction” fly unlike any other. Just stimulus it takes to flip the switch of negative trout and salmon and generate the response you want. Speaking of stimuli, the large eyes of a Jitterfly,unavailable on any other fly, add to it’s effectiveness. Look at the reviews online and you’ll see positive and negative comments. One of which, I’ll call a whine, “I don’t like them, because the mylar skirt gets ripped off after it catches 4 or 5 fish.” The mylar material of a Jitterfly is exactly the same as that used in a Howie Fly and no more delicate. I’ve caught many hundreds of kings, browns, steelhead on Jitterflies and never had one “destroyed” by just 4 or 5 fish. When the mylare does get a bit chewed up, like most other flies, they often work even better than new ones. When the mylar gets completely shot, if you tie your own flies Howie Fly style, it takes only a coupleof minutes to retape new mylar on a Jitterfly body. A couple negative reviews are correct. 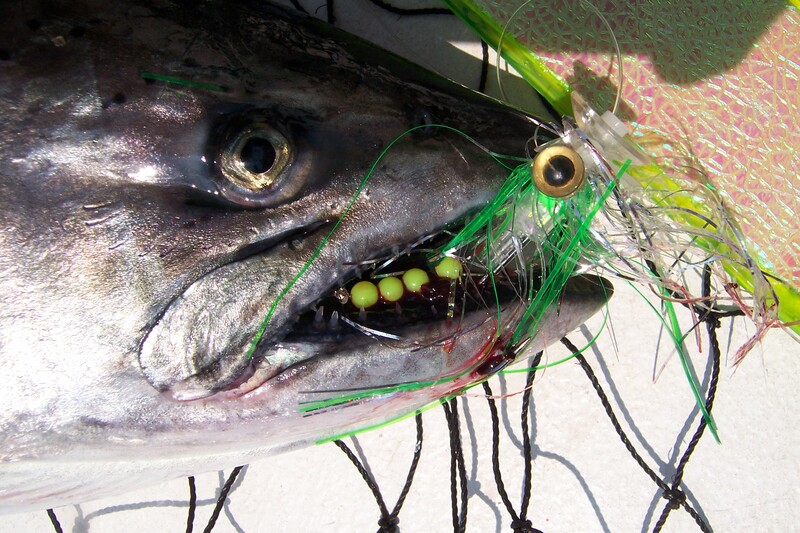 Trout and salmon will occasionally or finally rip one or both eyes off.., “Oh, well!” Also, the single fixed hook on a Jitterfly is a little light and will occasionally straighten enough to lose a fish if a release is set extremely tight or too much “oomph” is put to a big king. I rarely have had one of these fixed single hooks open up, but it has happened. Sooo, there is a time and place for every rig and lure in your tackle box, including Jitterflies. When fish are slurping everything in sight, it’s no trick to catch them on most anything, including standard flies trolled behind a variety of flashers. It’s when trout and salmon are lazy, negative, or just plain fussy that Jitterflies come into their own. This might be during early and mid season when feeding fish are inactive or later in the season, midAugust through September, when staged browns and salmon are off their feed. In late season from midAugust through September, Jiterflies along with Sushi Flies are always in the water behind 8”, 11”, and 13” flashers. The deeper you’re fishing and the later in the season, the better the larger flashers work. When cohos move into Mexico Bay and the Oswego area and charter customers want them, at least two 8” Hot Tamale Chips with Silent Assassin Jitterflies get wet. Like every other technique, there is a Jitterfly learning curve. They catch fish “as is”, right out of the box, but there are ways to improve their effectiveness. One important way, because they have their own action, is to fish them on a longer leader than standard flies. Check the “Fishing Hotline” page on my Fish Doctor web site for more details and photos on fishing this deadly item.